Graphics should be considered vital when doing anything with data. R has amazing graphical capabilities. It is becoming more and more common for advertisements for jobs involving data analysis to mention R. The demand for people who know R is growing rapidly. The jobs that mention R are better paid than those that just require spreadsheets. And rightly so — data analysis is done better and faster in R.
If you are an employer, you will get more data analysis for the amount you spend by moving to R (plus the analyses are more likely to be bug-free). If you do data analysis, then you may be able to get higher pay by knowing R — maybe not now but probably soon. Obviously you need to install R on your computer before you can use it. That’s easy to do — you’re unlikely to have any problems. You can use R as you’ve just downloaded it, but a nicer way is via RStudio, which also appears to have non-problematic installation. I believe that if you install RStudio without installing R first, then it will do the R installation as well. The command above reads the data from the file and puts it into an object called superbowl. Figure 1: Boxplot of Super Bowl data. 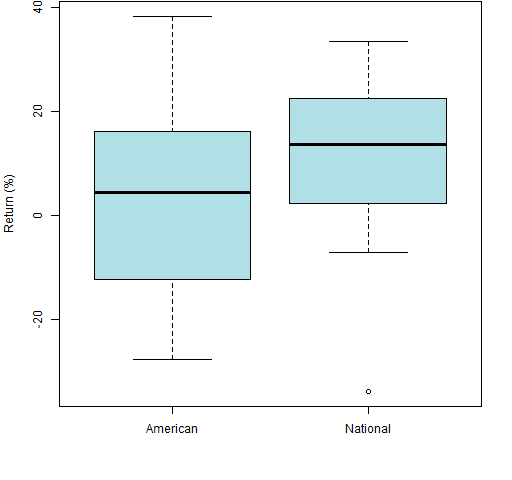 If you don’t understand them, you should read an explanation of boxplots. You can also learn about the somewhat horrifying story of the Super Bowl data. In both spreadsheets and R there are likely to be different types of data in different columns: numbers, character data, dates and so on. The difference is that R forces there to be only one type of data in a column. The “> ” is R’s prompt, you type what is after it (and hit the “return” or “enter” key). This says that there are 45 rows and 4 columns. You might have expected the number of columns to be 5 and not 4. The years on the very left are row names rather than actually part of the data, similar to how “Winner” is a column name and not part of the data proper. This is the same way you ask for help for functions. The Ct object is a vector, not a data frame. “Impatient R” provides a grounding in how to use R.
“Some hints for the R beginner” suggests additional ways to learn R.
If you’re using Postgres for RDBMS, then you can embed R in your application using PL/R. And, while I’ve not attempted, PG/9.3 has improved foreign databases (aka, federation) integration, so one could use R functions in the PG engine and report (and write, to some extent) from other databases. There is, at yet, no native driver for DB2 (JDBC/ODBC will work), but there are for most other databases. Great stuff Pat, nice to see R being extolled for spreadsheeters. First thing I do with any spreadsheet-loving students is send them to read your Spreadsheet Addiction. But they still get scared by the code. What do you think of the new R Commander version? I’m pretty impressed, as an entry-level for beginners. Thanks — I haven’t looked at R Commander in a while. I think anything that reduces the fear and trouble of converting to R is a good thing. Pretty nice article. I will keep that in mind for a later use. In a blog post called “Why use R?” Josh Ulrich points out that the thought process is explicit in R code but not in spreadsheets.